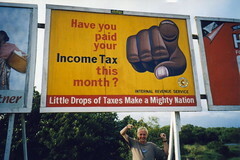 I have found out an easy way to pay your income tax and the ability to save some money at the same time. That is by making Nets payment with Standard Chartered’s XtraSaver Card at AXS Station or SAM which are readily available at MRT stations across Singapore. By making payments at AXS Station or SAM, you can avoid the long queues at Singapore Post Office. Standard Chartered’s XtraSaver offers 0.5% CashBack on all NETS transactions! 0.5% might not seem alot but it is still your money! Currently, it seems that payment cannot be made by using credit card. It would be good if we have the option to do so.